A small state in the north means Rhode Island butterflies number a bit less than the average for other states with larger territories. The state also does not designate an official state butterfly. Regardless, visitors to the state have an opportunity to see a fairly stable population of common East Coast butterflies. This introduction provides a list of the butterflies along with a handful of pictures. Additional butterfly pictures and information can be found by pressing the green butterflies button. Most states in the Northeast have more yellow butterflies than white butterflies in the Pieridae family, Rhode Island is no exception. The top picture shows a Sleepy Orange butterfly. Residents want to know if you’ve seen this butterfly. There are historical records of sightings, but the most recent butterfly lists omit the species. 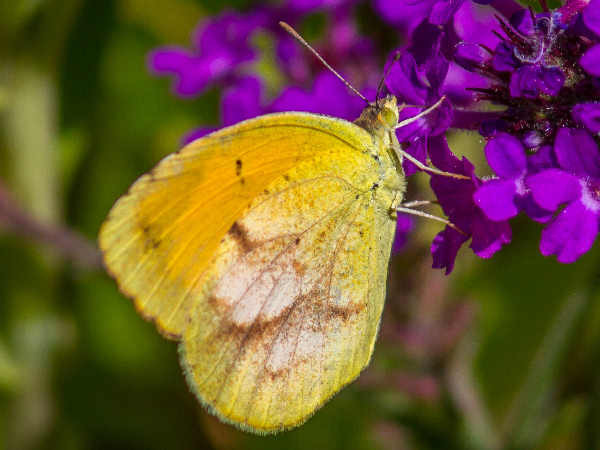 Rhode Islanders will most likely see the Clouded Sulphur and Orange Sulphur. Unless you are a very butterfly fortunate person in Rhode Island, the Cabbage White begins and ends the white butterfly conversation. 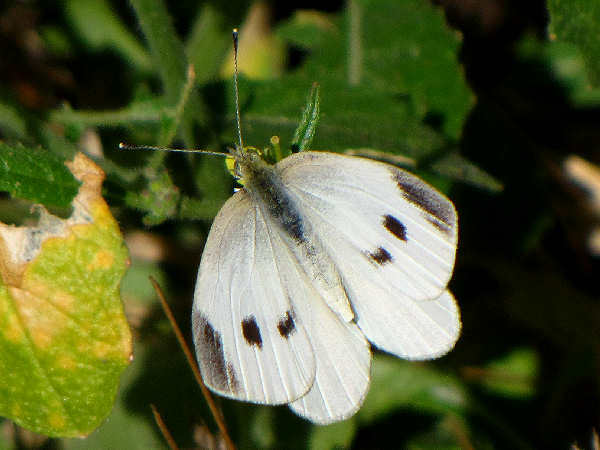 Females like the one in the picture have two spots per wing. Males have one spot per wing. The other species are either accidental tourists or have only a historic presence. The paucity of blue butterflies in Rhode Island is a bit confusing. The Tailed-blue and Azures are common because their larvaie feed on very common plants such as clover. Differntiating between the two is easy. One has a tail like apendage on the hid wing, the other does not. Tourists and residents can always look to the brush and flowers for the hairstreaks. 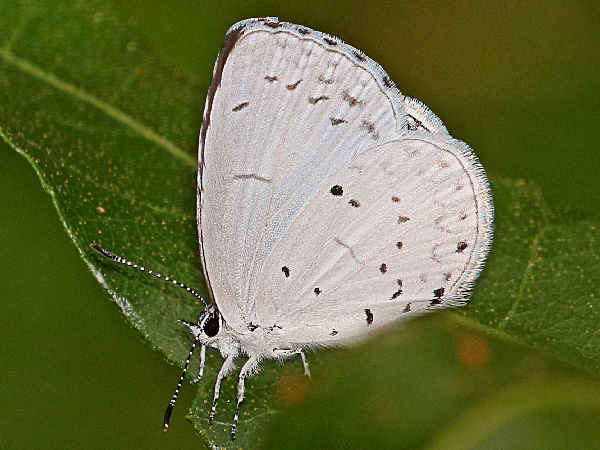 Some such as the White M Hairstreak are rare. , a very common species throughout the Eastern United States. Most other species are considered uncommon. 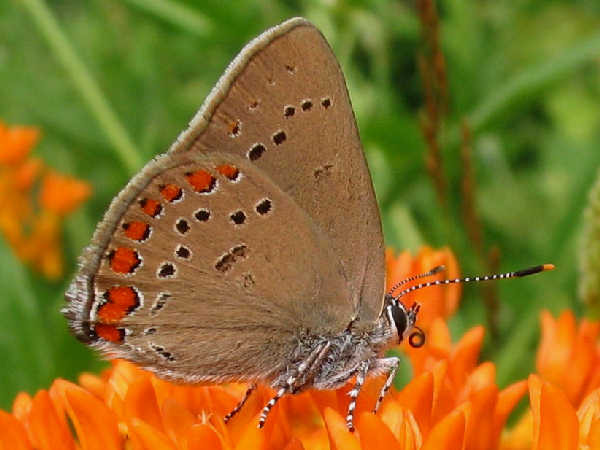 The large number of hairstreak butterfly species assures that a few might show up from season to season. The picture shows a Coral Haristreak. 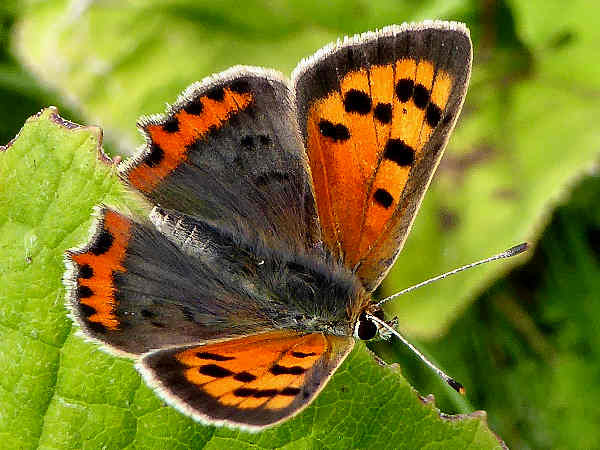 The American Copper Butterfly is th most common of the Copper butterfly species. Rhode Island gardens are filled with Brush Footed butterfly species from spring to fall. They mostly have orange color in the wings. 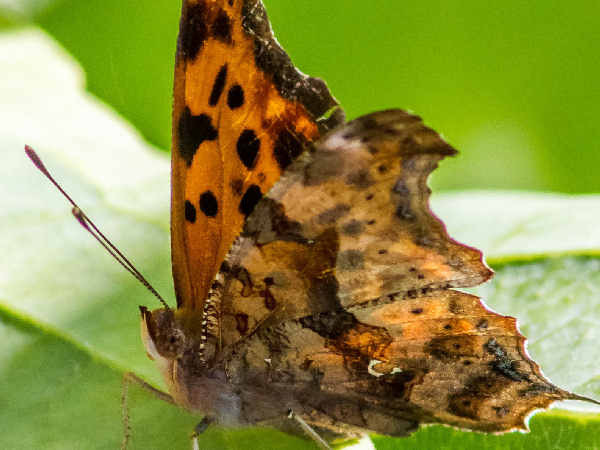 The picture shows a Question Mark butterfly. Species such at the Great Spangled Fritillary, Pearl Crescent and American Lady are very common. Violets are great for attracting Fritillary butterflies to the garden year after year. They serve as larval host plants. A nice purple flower in the garden is all anyone needs to attract the Pearl Crescent to the back yard. It serves as a host for the caterpillar. Almost any nectar flowers will attract the American Lady to the garden. They migrate in large numbers from South to North after the breeding season, and they are looking for a nice summer vacation home. The Eastern Tiger Swallowtail will be the most commonly seen swallowtail butterfly in Rhode Island. Folks with Black Cherry trees and Tulip Trees in the yard also provide the necessary larval plant hosts. 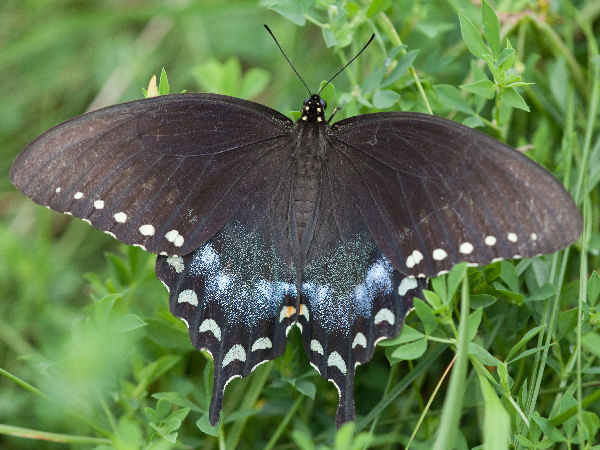 The picture shows a Spicebush Swallowtail and they are present where ever Spicebush grows in the state.